PRISM: What you need to know. The Washington Post and The Guardian have revealed a US government mass Internet surveillance program code-named "PRISM". They report that the NSA and the FBI have been tapping directly into the servers of nine US service providers, including Facebook, Microsoft, Google, Apple, Yahoo, YouTube, AOL and Skype, and began this surveillance program at least seven years ago. See PRISM slides explaining the program. 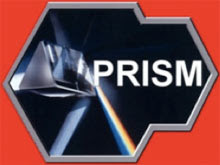 Note how the PRISM symbol is in the shape of a key, the hidden meaning of the symbol implying that this program is the key to unlocking a vast data mining operation of the U.S. govenment. Edward Snowden who leaked this information originally has stated that this is just the TIP of the iceberg of what the U.S. government is doing through its alphabet spy agencies to spy on innocent Americans. Also note what a prism does. A prism is a piece of glass or other transparent material cut with precise angles and plane faces. Prisms are useful for analyzing and refracting light (see refraction). A triangular prism can separate white light into its constituent colours by refracting each different wavelength of light by a different amount. The PRISM name and symbol no doubt was picked for a reason. The name PRISM then implies that the program is transparent, unkown by its target and yet powerful enough to sift through vast amounts of monitored electronic communications to separate out individuals much as a real prism separates out various wavelengths of white light. Ingenious?, No. Diabolical. PRISM was launched from the ashes of President George W. Bush’s secret program of warrantless domestic surveillance in 2007, after news media disclosures, lawsuits and the Foreign Intelligence Surveillance(FISA) Court forced the president to look for new authority. Congress obliged with the Protect America Act in 2007 and the FISA Amendments Act of 2008, which immunized private companies that cooperated voluntarily with U.S. intelligence collection. (The U.S. government knows that the carrot approach works better than the stick!) PRISM recruited its first partner, Microsoft, and began six years of rapidly growing data collection beneath the surface of a roiling national debate on surveillance and privacy. Late last year, when critics in Congress sought changes in the FISA Amendments Act, the only lawmakers who knew about PRISM were bound by oaths of office to hold their tongues. The well known Jim Marrs has this to say regarding the Edward Snowden NSA PRISM revelations. "And I think the key thing to remember is that Ed Snowden basically is not telling us anything that so many of us knew already. What he is doing is giving inside confirmation to the fact that your government spys on you ok, and it has nothing to do with security because the whole 'War on Terrorism' is basically a fraud anyway because, yes, there are foreign people who would like to harm the United States, but if left to their own devices they probably couldn't afford to rent a camel to get over here(the United States)." The NSA has built an infrastructure that allows it to intercept almost everything. With this capability, the vast majority of human communications are automatically ingested without targeting. If I wanted to see your emails or your wife’s phone, all I have to do is use intercepts. I can get your emails, passwords, phone records [even] credit cards. I’m willing to sacrifice all of that because I can’t in good conscience allow the US government to destroy privacy, internet freedom and basic liberties for people around the world with this massive surveillance machine they’re secretly building. Any analyst at any time can target anyone. Any selector. Anywhere. Where those communications will be picked up depends on the range of those sensor networks and the authority that that analyst is empowered with. Not all analysts have the power to target anything. But I, sitting at my desk, had the authority to wiretap anyone, from you or your accountant to a federal judge to even the president if I had a personal email…. Even if you’re not doing anything wrong, you’re being watched and recorded. The storage capability of these systems increases every year, consistently, by orders of magnitude, to where it’s getting to the point where you don’t have to have done anything wrong, you simply have to eventually fall under suspicion from somebody, even by a wrong call, and then they can use this system to go back in time and scrutinize every decision you’ve ever made, every friend you’ve ever discussed something with, and attack you on that basis, to sort of derive suspicion from an innocent life and paint anyone in the context of a wrongdoer. As I have always stated: Its all about power and control. Controlling the people of the United States. Why has the DHS ordered millions of rounds of ammunition? Why are police departments all over the country applying for and obtaining surveillance drones? What are they preparing for? It's obvious. War with the American people. What is Edward Snowden's greatest fear? It is the same concern that I have as an American citizen. A one world system and government that will crush any opposition to it's goals including taking a 'mark' to buy or sell in the future.